We operate a small farm in the piney woods of northeast Texas and are working to encourage and support people who are interested in growing their own food naturally, by using various "no-till" gardening and other natural techniques; and without the use of chemicals, pesticides, herbicides, or any "sides." Our philosophy is that everyone, including those "pesky pests" get to eat at our farm. God created a perfect nature, even if our understanding (or acceptance) of it is imperfect. Therefore, if we stop trying to control every aspect of it (the natural world) eventually everything finds its own place in the garden and gets along just fine. Kind of like that first garden we've heard so much about! In addition to raising amazing food, we raise Nubian, Saanen, Alpine, and dairy-cross goats for milk and cheese, Boer-cross goats for brush management and for sale, and luxurious handmade goat milk soaps and other bath and home products.The goal is to live as independently and naturally as we can. 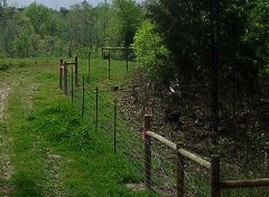 Our farm is located about 5 miles West of Gilmer, Texas. We currently raise registered Nubian dairy goats for milk, and unregistered percentage goats for pets, brush control, and meat. Check out our For Sale page to see if we have any goats available. Please navigate our site by following the links on the menu above. If you are interested in any of our products or would like more information, please e-mail us at kormsby@etex.net or call us at (903) 725-3473.